This standard base LED from EarthTronics is energy efficient, requiring only 8 watts of power for operation. It is a dimmable, warm white light with a 120 degree beam. This LED light has the Energy Star approval rating, and with a lifetime of 15,000 hours, frequent replacement won't be necessary. 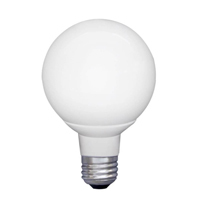 In addition, the globe shape makes this bulb an easy replacement for energy consuming 40 watt incandescent lights. G25 bulb provides 500 lumens, capable of dimming to less than 5%. Energy Star rated. Chipset provides 2700K white light with a high color rendering rating of over 80.